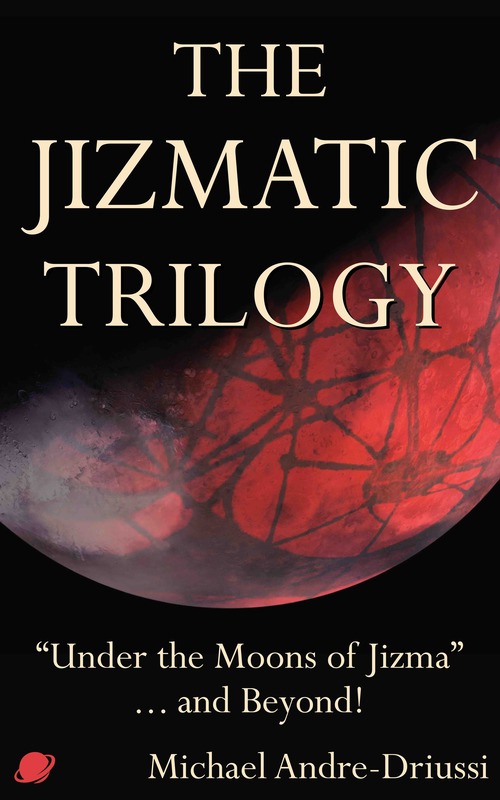 "The Jizmatic Trilogy" is a collection of three short stories: "Under the Moons of Jizma," "The Gods of Jizma," and "Secret Master of Jizma." These are adventure tales in the style of a century past (circa 1912) but with strange currents of later eras. Each of the three is about eight thousand words: the total length is that of a short novella. "Under the Moons of Jizma" first appeared in the magazine Interzone 110 in 1996, beginning the strange mash-up tale of Edgar Rice Burroughs and William S. Burroughs upon a Martian landscape. Only now can the rest of the tale be told! "Under the Moons of Jizma" is legally available for free on the internet, and it is included in this collection along with the two sequels ("The Gods of Jizma" and "Secret Master of Jizma") published here for the first time. Curious readers are encouraged to find and read the free version, then come back for more. The Encyclopedia of Science Fiction says of Michael Andre-Driussi's fiction: "his Parodies of what might be called pulp Scientific Romance idioms are exact and arousing." That should prove true for this outing as well, except that this is less parody and more homage. "The Jizmatic Trilogy" is in the same, er, tradition as Philip Jose Farmer's "The Jungle Rot Kid on the Nod" (1970), which asked, "What if William S. Burroughs wrote Tarzan?" This experiment probes "What if Edgar Rice Burroughs wrote Naked Lunch, set on Mars?"